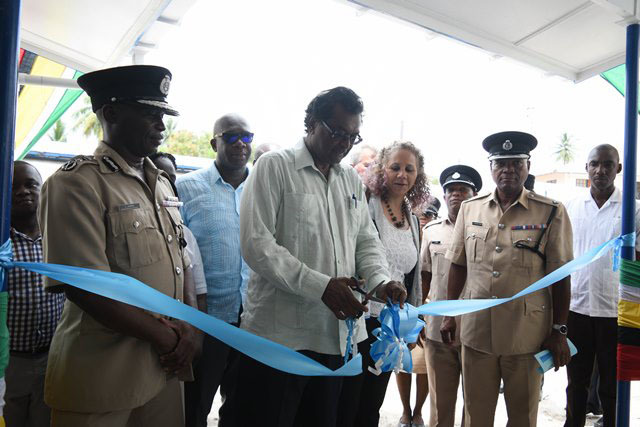 A new $117 million Mackenzie Police Station, which will also serve as the headquarters of ‘E’ Division (Upper Demerara-Upper Berbice) was commissioned yesterday by Minister of Public Security Khemraj Ramjattan. The Department of Public Information (DPI) said in a report that the commissioning of the building follows with the appointment of a new commander of the division, Senior Superintendent Linden Lord, who at a simple ceremony received the keys from Ramjattan. 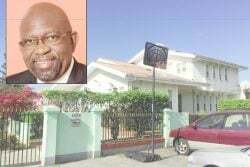 The two-storey building is part of the $1.8 billion Guyana Police Force remodelling programme that has been made possible by the Inter-American Development Bank (IDB) through its Citizens’ Security Strengthening Programme (CSSP). The rehabilitation of 18 other police stations is being funded under the CSSP, the report noted. The DPI report said there is also a fully automated case management room, a spacious waiting room and a training room for ranks. Commissioner of Police Leslie James was reported as saying that the police force is very appreciative of the strides taken by the political administration in ensuring the improvement of standards within the force. The commissioner also lauded the government’s commitment to ensuring that the citizenry is safe in their communities. Meanwhile, IDB Country Representative Sophie Makonnen noted that the IDB will continue to support institutional capacity building and citizen security through the effective prevention of crime and violence. The physical appearance of a police station is important, she said, since it affects the sense of security of community members. Makonnen also expressed her satisfaction at knowing that the new police stations will more effectively tackle gender-based violence and that these victims can now report their cases in confidentiality. The DPI said 12 police stations have already been completed under the programme. These include stations at Kwakwani, Annai, Aishalton, La Grange, Cane Grove, Suddie, Mabaruma and Port Kaituma. Some of the buildings rehabilitated in 2018 include the Parfait Harmonie, New Amsterdam, Lethem and Matthews Ridge police stations.